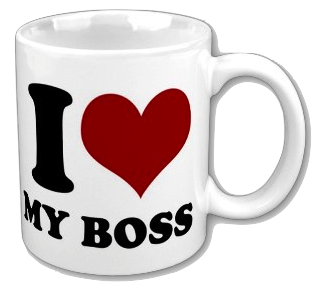 How many "I Love My Boss" coffee mugs are in your business? A recent survey by a recruitment business indicated that nearly twice as many businesses had reported reduction in employee engagement from two years ago (24% to 13%). The investigation contributed the diminishing engagement squarely on the shoulders of bosses. Owners of a Small Business normally play the role of the Boss particularly if other people are involved in the business. The facts are, the Boss that drives the business needs to be more then a hard worker and efficient. A Wow Boss inspires their staff, to share a common vision and to encourage new thoughts and ideas. Improved productivity and efficiencies will be a measure of their ability to inspire and communicate with their staff. In large organisations, most people get promoted into management roles because they were good at their job, not because they possess any real management potential. However I see the same mishaps occurring within small businesses as they grow. People are promoted to management because they do their current role well. This approach is the key reason for non engaged staff. The promoted person remains in their comfort zone and struggles with the newly imposed people skills and leadership knowhow. For many, the experience is stressful and the position they don’t necessarily want. If you are going to promote someone internally to be the Boss because you feel they have been loyalty over many years and have earned there promotion, then I suggest that you consider this. There is nothing worse then seeing your business failing because of a wrong selection choice. If you are going to promote internally, then I suggest that you set them up to succeed and not to fail. Invest in training and a coach for your new managers. Take Responsibility. The first step to avoid falling into the “Bad Boss” category is to take responsibility. Regardless of how effective you are, you can always do better. Who are you? You have to know yourself before you can effectively manage others. The way you manage is a reflection of your personality, culture and upbringing. Take the time to think about how your life journey has shaped the way you manage and make decisions. Facing recent mistakes by assessing what went wrong and why. Try to identify any commonalities and take responsibility for your part and make sure your actions are not repeated. Ask and Listen to others such as mentors, coaches, co-workers or key employees about your management style. Seek constructive criticism and LISTEN to the good, bad and ugly. No But's, However's or Comments back.... Just Listen. Commit to at least one action based on this feedback. Listen First and then Ask questions later. A good boss is a good listener. It's not an easy task but learn to be an Active listener. The people that work for you are your experts and they need to know you hear them. A good way to reinforce your active listening is to confirm back what you have just heard. Ask, Don’t Tell. Resist the temptation to tell your staff what to do. Instead, ask them what they would do to solve a problem. Successful managers don’t hand their people solutions, they teach them how to solve for themselves. Being a Boss is very much about being a coach to your team. Identify Teachable opportunities when mistakes are made. Avoid blame and in-brace learning and that the time to teach someone a new skill. The worse thing you can do is tell someone "I will do it myself" or hand it onto someone else. If thats their role, then set them up to succeed next time. After all, life is about learning and trying until your succeed. Remember riding a bike for the first time! Encourage your team with positive feedback and use alternative methods to punishing. Punishment may stop bad behaviour, but it doesn't produce new good behaviours. Reinforcement or reward good work. People like they good work recognised and a few words of appreciation from their Boss is all it takes. By the way, it's rarely about money or gifts. Reward one positive act each day and always be on the lookout. All of your team will do good work, so be sure to notice it. This also applies to people struggling to engage or perform. A word of encouragement when effort is shown will go a long way in creating more positive change. Be Fair, Not Equal. For most Bosses they worry about being equal to all staff. Don’t treat people the same as they are not the same. We all have different needs, which means that a motivator for one person may not be a motivator for another. Know what motivates each of your team and use that knowledge. As a Boss you are responsible for setting the tone and culture for a positive and productive work environment. When bosses fail to do this, staff turnover increases, morale and customer satisfaction drops, work output and quality decreases and hiring expenses increase. Get it right and your staff will promote and drive your business to a new level.